Hungarian Christian theologian and lexicographer; born March 18, 1815, at Inócz, Zemplén, Hungary; died Sept. 1, 1891, at Budapest. He was the son of a tenant-farmer, from whom he received his first instruction in the Bible and the Talmud. After continuing his Talmudic studies at Nagyvárad and Pápa, Bloch taught at Moór and Surány, where he became acquainted with the Greek and Roman classics. During 1837 and 1838 he attended lectures in geometry and higher mathematics at the University of Pest, and at the same time began his literary activity by contributing articles to the "Pester Tageblatt" and by his "Hasznos Mulatságok" (Useful Talks), which were favorably received. The talented author was recognized as a new champion of the Hungarian national cause. Bloch as Jew could, however, not obtain a diploma; he therefore, in the fall of 1839, went to Paris, to continue his studies. 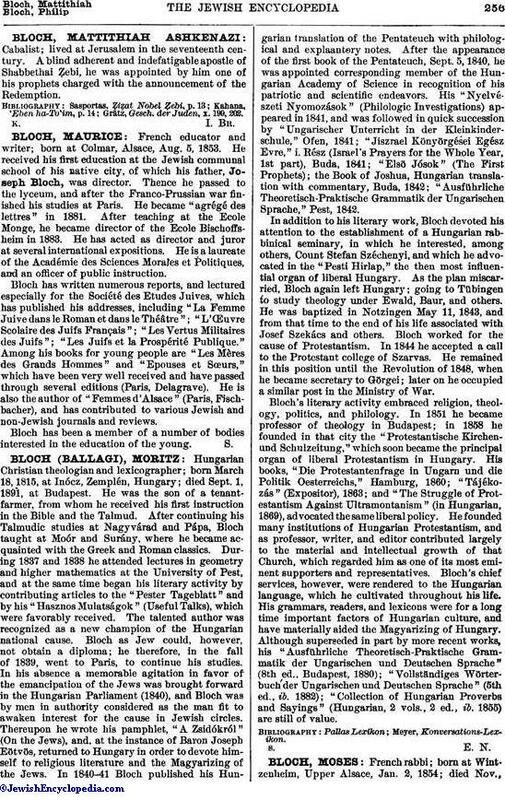 In his absence a memorable agitation in favor of the emancipation of the Jews was brought forward in the Hungarian Parliament (1840), and Bloch was by men in authority considered as the man fit to awaken interest for the cause in Jewish circles. Thereupon he wrote his pamphlet, "A Zsidókról" (On the Jews), and, at the instance of Baron Joseph Eötvös, returned to Hungary in order to devote himself to religious literature and the Magyarizing of the Jews. In 1840-41 Bloch published his Hungarian translation of the Pentateuch with philological and explaantory notes. After the appearance of the first book of the Pentateuch, Sept. 5, 1840, he was appointed corresponding member of the Hungarian Academy of Science in recognition of his patriotic and scientific endeavors. His "Nyelvészeti Nyomozások" (Philologic Investigations) appeared in 1841, and was followed in quick succession by "Ungarischer Unterricht in der Kleinkinderschule," Ofen, 1841; "Jiszrael Könyörgései Egész Evre," i. Rész (Israel's Prayers for the Whole Year, 1st part), Buda, 1841; "Elsö Jósok" (The First Prophets); the Book of Joshua, Hungarian translation with commentary, Buda, 1842; "Ausführliche Theoretisch-Praktische Grammatik der Ungarischen Sprache," Pest, 1842. In addition to his literary work, Bloch devoted his attention to the establishment of a Hungarian rabbinical seminary, in which he interested, among others, Count Stefan Széchenyi, and which he advocated in the "Pesti Hirlap," the then most influential organ of liberal Hungary. As the plan miscarried, Bloch again left Hungary; going to Tübingen to study theology under Ewald, Baur, and others. He was baptized in Notzingen May 11, 1843, and from that time to the end of his life associated with Josef Szekács and others. Bloch worked for the cause of Protestantism. In 1844 he accepted a call to the Protestant college of Szarvas. He remained in this position until the Revolution of 1848, when he became secretary to Görgei; later on he occupied a similar post in the Ministry of War. Bloch's literary activity embraced religion, theology, politics, and philology. In 1851 he became professor of theology in Budapest; in 1858 he founded in that city the "Protestantische Kirchenund Schulzeitung," which soon became the principal organ of liberal Protestantism in Hungary. His books, "Die Protestantenfrage in Ungarn und die Politik Oesterreichs," Hamburg, 1860; "Tájékozás" (Expositor), 1863; and "The Struggle of Protestantism Against Ultramontanism" (in Hungarian, 1869), advocated the same liberal policy. He founded many institutions of Hungarian Protestantism, and as professor, writer, and editor contributed largely to the material and intellectual growth of that Church, which regarded him as one of its most eminent supporters and representatives. Bloch's chief services, however, were rendered to the Hungarian language, which he cultivated throughout his life. His grammars, readers, and lexicons were for a long time important factors of Hungarian culture, and have materially aided the Magyarizing of Hungary. Although superseded in part by more recent works, his "Ausführliche Theoretisch-Praktische Grammatik der Ungarischen und Deutschen Sprache" (8th ed., Budapest, 1880); "Vollständiges Wörterbuch der Ungarischen und Deutschen Sprache" (5th ed., ib. 1882); "Collection of Hungarian Proverbs and Sayings" (Hungarian, 2 vols., 2 ed., ib. 1855) are still of value.